The absolute best place to get started with the Bullet Journal is by going to the Bullet Journal website. 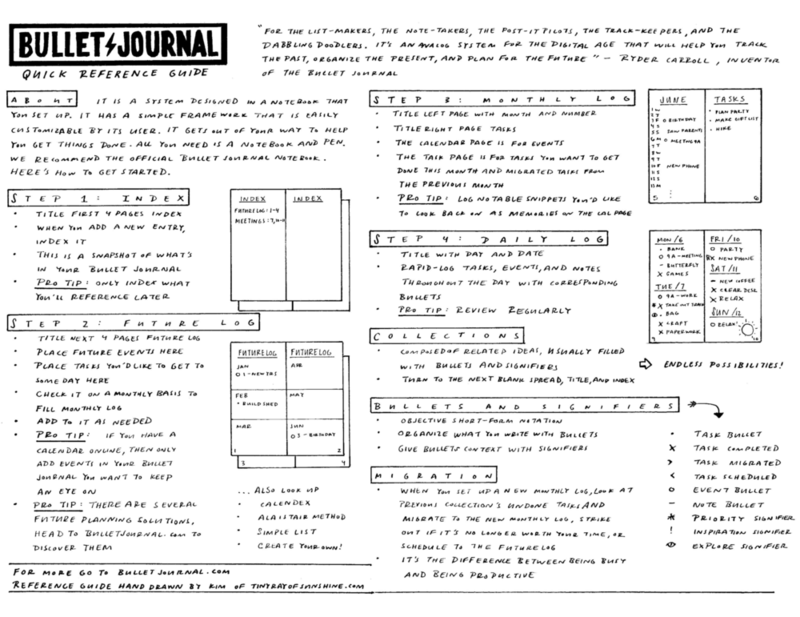 The Bullet Journal is an analog system created by Ryder Carroll, a Designer based in New York. In his words, the Bullet Journal is meant “to help you track the past, organize the present, and plan for the future.” It’s an amazing system that keeps a record of everything you could ever want to toss at it. It can be your task manager, sketchbook, journal, idea catcher, and much more! The Bullet Journal is a organizational system in a notebook that keeps track of anything you would like to write down in an coherent way. First, let’s talk about your motivation for using the Bullet Journal. Most of the people who Bullet Journal tend to do it because it’s a flexible system that lets them work the way that they work. It’s important to think about what you want a system to do for you before you dive in. That said, you’ll figure out your needs more as time goes on, so get started after you’ve thought about it for a little while. As I mentioned before, however, you can get started with any pen and notebook that you have on hand. If you decide that you like the system, you can grab a different notebook and pen later on. Indexing, Collections, Rapid-Logging, and Migration make up the foundation of the Bullet Journal. This is the genius of the Bullet Journal. In order for Indexing to work, you need to number your pages, this way your entries can be added to the Index. The Index is how your organize your entries in your Bullet Journal. Entries in the Bullet Journal are called Collections. Every page in the Bullet Journal is given a topic and these topics are referred to as Collections. Every entry in the Bullet Journal is by definition a Collection, regardless of what it looks like. Also create a blank page to keep Events and Tasks you don’t have a specific date in mind to get to, but want to at some point, such as buying a motorcycle. The Monthly Log consists of two facing pages, one is the Calendar Page and the other is the Task Page. Use this to write down your Events and/or add a Note of what happened. The Calendar is laid out this way to give you enough space to write a short snippet of Events you may have going on and also to Note anything you may wish to remember. This will allow you to get a snapshot of what happened. This list consists of Tasks you want to get done this month and tasks from last month. I will explain the second part of this sentence in a moment. This is the heart of the Bullet Journal. This is used on a day-to-day basis. The date will be the topic. Throughout the course of the day you will rapid-log Tasks, Events, and Notes as they occur. No worries if you skip a few days here and there. The beauty of the Bullet Journal is that you can pick it up whenever! Collections are a group of related ideas. Every single page in the Bullet Journal is by definition considered a Collection. This includes the Monthly Log, Daily Log, Future Log, and any page you give a topic to. Every page in the Bullet Journal will have a topic assigned to it, thus every entry you add into your Bullet Journal is a Collection. To reiterate: every entry is considered a Collection. For example, a food log, shopping list, meeting notes, and more are all considered Collections. Collections can take any shape or form. Collections can be mindmaps, goal plans, trackers, brainstorming, journaling, sketchnotes, notes, blueprints, design mock-ups, sketches, doodles, ANYTHING. If your mind can conceive it, your notebook can contain it. Let's take a look at some examples of Collections to help you cement the idea that EVERYTHING you could ever want to add into this special notebook system is considered a Collection. Remember, a Collection is a grouping of related ideas, no matter what the form. You can make a list of anything! Here I made a list of songs I like. If you recall, in the Daily Log I have these songs with a Note Bullet. I have since Migrated them to a Collection to keep them in one place, as per the Bullet Journal guidelines when you find yourself writing down the same kind of idea over and again in your Daily Logs. Collections can begin organically, however, and do not need to be started in the Daily Logs. You can start a Collection anytime you want to write down related ideas. Collections can be logs of some kind. Here is the Gratitude Log I created to write down 3 things I am thankful for each night, seeing them all in one place makes my heart happy. Collections can be a series of notes. Collections can take a bit of form and set up according to how you need them. Here I set up a tracker and log hybrid to write down notes about how I feel after my C25K runs. Collections are free-form by nature, which makes it a perfect place to create mind-maps to connect thoughts. The thing to remember is that at its core, the Bullet Journal is based in a notebook, and because of this reason you can add anything to it and organize it with the Index. Simply begin an idea on a new page, give it a topic (title) and Index it! Simply making an intentional plan isn't enough, there needs to some sort of system implemented to help you reach your goals. A tracker is the perfect thing to help you reach your aims! Here's a week-by-week tracker related to the goal plan from the last photo. Sometimes you just want to turn the page and sketch. Simply make an entry in your Index called, "Sketches: 22, 45-49,..." and add to it to keep track of your Collections that span across several pages. Here are some quick sketches I made. There are many, many other forms and types of Collections I'm sure you could come up with! It's a notebook, first and foremost, and the blank page is a canvas to create anything you wish! Loosely paraphrasing from Ryder. You fill Collections with short-form notations. In the Bullet Journal, these notations are referred to as Rapid-logging. The Task Bullet is indicated by a dot: • and it turns into a completed, migrated, scheduled, or cancelled as needed. • Task - Precedes any Task you write down. > Migrated - If you didn’t complete a Task, you Migrate it to another Collection. < Scheduled - Tasks with specific dates in the future. These can be added to the Future Log. Indicated by an open circle: O. These are date-specific. You would add them to the according Collections: Future Log, Monthly Log, and Daily Log. Sometimes other Collections if you need to, for example as part of a project planning Collection. Indicated by a dash: -. These are Notes that you want to remember such as ideas, observations, thoughts, and facts. - Got to see AndyAna Jones! Signifiers add extra context to the Bullet Journal. This helps you to see at a glance what the Bullets represent. You do not need to add a Signifier to each Bullet, only the ones you’d like to have more information about stand out. You place these to the left of the Bullets. You can create your own Bullets and Signifiers as you see fit. For example, you can use a checkbox instead of a dot for a Task. Rapid-logging occurs throughout the entire Bullet Journal in Collections (this includes the Month Log, Daily Log, Future Log, and other Collections) by using the Bullets to jot down short snippets and Signifiers to add more context if needed. You do not need to use a Signifier with every Bullet, only add them to the ones you would like more information from at a glance. Review is key to keeping up with any system. In the Bullet Journal, there is a regular type of review process called Migration. Migration is the cornerstone of the Bullet Journal. Another way you could think of Migration is active reviewing. Migration is the act of moving over undoneTasks over to another Collection. You can also Schedule Events and Tasks to the Future Log is they will be occurring at another time. Migration is done at the end of the month when preparing the next Month Log. You look over the undone Tasks from your Collections and assess each one and Migrate the ones you still want to do over to the new Month Log. If there are Tasks you no longer want to do, cross them out. If there are Tasks and Events you want to Schedule to another month, add those to the Future Log. Next, Migrate Scheduled Events and Tasks from the Future Log to the new Month Log. You now know the framework of the Bullet Journal (Index, Collections, Rapid-logging, and Migration), now how do you apply them? When you create Collection, you add it to the Index. You Rapid-log with Bullets & add Signifiers to the left of Bullets as needed. You Migrate Tasks between Collections as needed and on a monthly basis. At the end of the month, look over through all of your Collections (This includes the Monthly and Daily Logs) to assess whether they are worth doing. If they are worth doing, Migrate them to the new Monthly Log. If they are not worth doing then cross them out, remove the noise. If they are worth doing, but at some other point in time, Schedule them in the Future Log (either in a specific month or in a blank Future Log page). The Index, Collections, Bullets, Signifiers, and even Migration can differ for everyone. At the beginning, I recommend going with the basic framework and then add as needed. Over the following weeks we will discuss variations of each of these and dive into alternatives to get the same effect. Really? EVERY entry/page is considered a Collection? Yes, at least according to careful analysis of the instructions in the official Bullet Journal notebook, Ryder mentions that Collections are one of the 4 key concepts and goes on to illustrate the 3 main ones: Future Log, Monthly Log, and the Daily Log. This makes a lot of sense and brings everything together in a concise way. What do you do if you’re out and don’t have your Bullet Journal? I usually have a small notebook with me, a mini Leuchtturm1917 (smaller than pocket) to be exact. I use it to write down an errands list or notes while I'm out and about. I've heard of others using a notes app on their phone and then migrating that information to their Bullet Journals when they get home. I’m a guy, and I don’t carry a bag with me, what notebook do you recommend to carry around in my pocket? Field Notes are a common choice. Here's an awesome article full of pocket notebook recommendations. I keep seeing all of these elaborate Bullet Journals and I’m a little overwhelmed. The awesome thing about the Bullet Journal is that you can keep it as simple or make it as complex as you like. My biggest tip is to keep it as simple as possible, even if you make a more complex layout later on. I always, always, always, strongly recommend keeping things as simple as possible such that you'll want to continue to use the system. If you find yourself not liking something in your notebook, simply turn the page, give the other one the bird, and move on! Life is too short to fret about a notebook page. What size and format notebook do you recommend for a beginner? I'll echo Ryder's recommendation to make sure your notebook is big enough that it's practical and small enough that you can carry it with you. Medium/A5 is a great choice. Zequenz does have a pretty cool size (small) that is in between pocket and medium, you might look into that! As for the format, I recommend a grid or dot grid to work with. You'll have much more flexibility. Leuchtturm1917 (Amazon //GouletPens) is the favorite notebook amongst Bullet Journalists. What do you recommend as a beginner fountain pen? My first experience of a fountain pen was a cheap Pilot Varsity. It's disposable and there's not much of a committment if you don't end up liking it. As a starter starter fountain pen, that's the one I recommend. If you want the real experience of one without investing too much, the Pilot Metropolitan (Amazon // GouletPens) is a popular choice, the fine nib in particular. I don’t have too much going on, can I still use a Bullet Journal? Honestly, I think everyone's handwriting is pretty awesome. That said, if you find your chicken-scratch less than enjoyable to you, a recent #bulletjournalchallenge was on improving your handwriting, check it out to get some tips. My biggest tip for improving your handwriting would have to be to slow down and/or write in caps. I like writing in caps because it forces me to really create the lines for the words and thus makes the words more legible. I use apps for things like my calendar, do I have to switch to full-analog? No, you can keep using the apps you already use! I always recommend sticking to the right tool for the task at hand. If a digital calendar works for you, then keep to that! Ryder, I, and many others use Google calendar in addition to the Bullet Journal. The Bujo (short for Bullet Journal) works nicely with other tools, it's a notebook, remember? (; I use plenty of apps concurrently with the Bullet Journal because that's what works for me. Stick to what works for you! What notebook did you use in these photos? I used a black dot Leuchtturm1917 (Amazon // GouletPens). This is my mock-up notebook, where I create ideas for the benefit of my readers when I want to share specific ideas. What's your relationship to the Bullet Journal? Collections are composed of 3 main types: Future Log, Monthly Log, and Daily Log. Other Collections are given a topic and Indexed. Collections are composed of Rapid-logging. Rapid-logging is short-form notation used in all of the Collections. Rapid-logging has 2 parts: Bullets and Signifiers. Bullets are made up of 3 categories: Task Bullet, Event Bullet, and Note Bullet. Signifiers are additional symbols that serve to give Bullets further context, you don't need to use them every time you use a Bullet, only add them to the ones you want at-a-glance information. Migration is the cornerstone of the Bullet Journal. According to Ryder, "it is the difference between being busy and being productive. "Migration is done on a monthly and yearly basis. To perform Migration, look through all the Collections (significantly, the Monthly and Daily Logs) you made over the last month and Migrate any tasks that you didn't complete and still want to do over to the new Monthly Log, cross out any irrelevant tasks (ask yourself, "is this worth my time?" to decide), and Schedule Tasks and Events you want to do at a later time to the Future Log. Please pin, email, and share this to anyone who you think might find it helpful! Bullet Journal links & more!